Love is the soul’s strongest passion. It is the most powerful motivator. We are shaped by what we love. 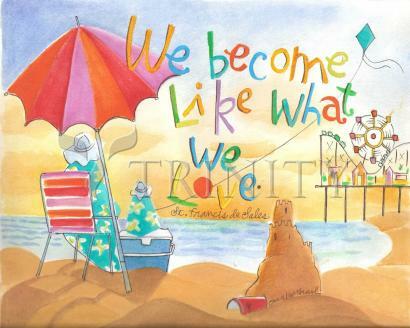 We become like what we love. Although at first the missionaries had little reward for their labors, they did not lose heart. Francis continually sought new ways to reach the minds of the people. He began to write brief leaflets, setting forth the leading dogmas of the Church as opposed to the tenets of Calvinism. These little papers, on which he worked in spare moments, were copied and recopied by hand and widely distributed. Later they were collected and printed in a volume called (Controversies). Copies of these leaflets in the original written form are still preserved in the convent at Annecy. Through an immense correspondence he brought encouragement and guidance to innumerable persons. For sixteen years a sharer in his work was Jeanne Francoise Fremyot (St. Jane Frances de Chantal), with whom he became acquainted in 1604, while he was preaching at Dijon. The baroness of Chantal was only twenty-four when, after the death of her husband, she decided to enter the religious life. One result of her meeting with Francis was the foundation, in 1610, of the Order of the Visitation, to meet the needs of widows and lonely women in poor health, "strong souls with weak bodies," who were deterred from joining other orders because of their physical condition. Some of St. Francis' best thought is to be found in the letters he wrote to this great woman, who was herself canonized in 1767. What is perhaps his most famous book, the (Introduction to the Devout Life), grew out of a series of casual letters written to another woman, a cousin by marriage, Madame de Chamoisy, who had placed herself under his guidance. This little collection of short practical lessons on true piety and everyday living was published in 1608. It was soon translated into many languages, and has continued to find readers. He was worn out, therefore, when he stopped at Lyons on his return. The convent of the Visitation provided him with a cottage on their grounds, where he stayed for a month. He spared himself no labor, giving the nuns instruction and advice, and continuing his preaching and ministrations through Christmas. On December 27 he had a paralytic seizure. He recovered speech and consciousness, and after receiving the Last Sacraments, he murmured words of Scripture, expressing all confidence in God's mercy. On December 28, while those kneeling about his bed recited the litany for the dying, he breathed his last. He was fifty-six, and in the twentieth year of his episcopacy. In his (Treatise on the Love of God), Francis had written, "The measure of love is to love without measure," a precept which he had consistently taught and lived.